Rich Horton and Jonathan Strahan are going head to head with their similarly sized annual anthologies, both of which cover fantasy and science fiction. Horton had earlier had separate volumes for each genre, and in this volume his introduction ponders the growing number of types of fantasy (the traditional ‘heroic’ fantasy, sub/urban fantasy, speculative). So what of the content? I’m running somewhat behind, reviewing the stories in the volumes published in 2009, starting in March 2010. The story reviews will be featured individually on Best SF, and I’ll update this page on an ongoing basis. Kij Johnson. 26 Monkeys, also The Abyss. Originally in : Asimovs, July 2008. In which Aimee inherits a circus act involving 26 monkeys which disappear onstage. It’s a strange life for Aimee, but one that is a passing phase in her life, as she must pass on the act, but with it having changed her and her life. More of an F&SF kind of story, than a ‘mov’s. This summary does rather do the story a dis-service, in not referring to the way the story is written, in a couple of dozen short stanzas, rather than a traditional narrative..
Elizabeth Bear. Shoggoths in Bloom. Originally in : Asimovs, March 2008. I’ve little knowledge of the Cthulhu mythos, so apologies if I’m missing a trick here. The story features shoggoths, jelly like creatures off the Maine coast. A young black academic visits to study the creatures, and it being the 1930s we find out a lot about being a black American at that time, with another war on the way. The academic finds out that it is not the race that evolves, but individual shoggoths – and he is offered an opportunity to offer leadership to the largely unthinking creatures he has been studying, who exist simply to obey. But rather than taking that opportunity, it is to France he heads, making that same evolutionary step himself. Originally in : MIT Technology Review. Short piece in which a drug treatment is having spectacular effects with the psycho/sociopaths on which it is being tested. Now seeing their victims as people and feeling remorse for their actions, for some in the treatment programme the guilt becomes too much. Christopher Golden. The Hiss of Escaping Air. Originally in : The Hiss of Escaping Air. Contemporary Hollywood is the setting, with a recently-divorced woman wishing to wreak revenge on her multi-millionaire produce ex-husband. Her plan is to have stolen a red balloon, part of his collection of Hollywood memorobilia. The balloon is reputed to have extraordinary powers, and caused a film made featuring to be shelved. The story skirts around the nature of muse in Hollywood, but leaves the reader to decide whether the reputed powers are real or not. For my money, a story that really offers little out of the ordinary, and to feature in a Years Best SF/Fantasy, a story has to be well out of the ordinary. Naomi Novik. Araminta, or, The Wreck of the Amphidrake. Originally in : Fast Ships, Black Sails. A fairly routine pirate story. Sure, there’s a fantasy element in that the female heiress making a risky sea journey, is able to use magic to transform herself into a man, but that’s about it, so on that basic you could count Pirates of the Caribbean as fantasy. Which I wouldn’t. The opening promises more, with the background to the society in which the heiress lives being described, but after that its a chase and boarding by pirates, getting close to the pirate captain (!) and then a dramatic ending with a goddess, but I was skimming the final paras then. For my money, several nautical miles behind Elizabeth Bear and Sarah Monette’s ‘Boojum’ from the same collection, chosen by both Dozois and Hartwell/Cramer for their Year’s Best volumes. Alice Sola Kim. We Love Deena. Originally in : Strange Horizons. A tale of obsession, in which a rebuffed woman goes to extreme lengths to rekindle the passion with her lover – taking over other people, including, memorably, Angelina Jolie, in order to be near her lost love. Ted Kosmatka. The Art of Alchemy. Originally in Fantasy & Science Fiction, June 2008. Excellent SF/science thriller. It has a sense of place (the dying little steel towns of NW Indiana), and has an interracial relationship : it brings you up a little when the issue of race between the protagonist scientist and the attractive young science politico is raised, in that its novelty suggests that the complexities of real-life issues don’t regularly appear in SF. The scientist is at the leading-edge in working with metal with a memory – metal which can remember and revert to, a specific shape they are designed to be in at a specific temperature. The drama is set up straight away (with their relationship being developed through flashbacks) as a shadowy Eastern European offers them some even more hi-tech, at a price. What he offers is something that would pull the rug from under the dominant steel companies – a carbon nanotube : immensely strong and virtually invisible. The couple are in a quandary – if they hand over this tech to their parent company, they will sit on the new tech in order to maintain the status quo with steel as a major player in the world markets. The alternative : putting the tech in the public domain, and seeing what can be made of the tech. However, the steel companies are on the case, and will go to any lengths to get their hands on the nanotube sample, and the story reaches a dramatic, murderous, climax. Originally in : Fantasy & Science Fiction, December 2008. A young man’s solitary existence is shattered by an angel which falls, quite literally, from heaven. The angel is human save for the huge wings, and has very human needs and desires, the latter of which he is happy to satisfy. Margo Lanagan. The Fifth Star in the Southern Cross. Originally published in Dreaming Again. A dark, disturbing glimpse of a near future, which starts with an almost Eraserhead-ish grotesquery, in which a man visiting a brothel finds the ‘woman’ who is servicing him, breaks off halfway through to give birth to a .. something. It’s a fucked-up world, with a lot wrong with it. However, the guy gets some good news – the liaison he had with a local girl a while back resulted in a 100% perfect birth – it’s seems his DNA is fine, and he may well have a route out of the daily grind as a sperm donor. It’s not an easy read, but it’s not gratuitous, although it is bleak, clearly in a similar vein to the ‘sordid wretchedness’ of her ‘Tender Morsels’, which won the World Fantasy Award. It was the ultra-reactionary Daily Mail newspaper which criticised that novel thus, and if anything upsets that newspaper, it’s bound to get my approval. Peter S. Beagle. King Pelles the Sure. Originally in : Strange Roads. King Pelles bemoans the quiet life of his kingdom, and the fact that he will be lost to history, with those kings who fought mighty battles being remembered by future generations. He seeks out war – something he rapidly regrets. Fleeing, he despairs of being able to atone for his actions. S’okay, but little beyond the ‘be careful what you wish for’ trope. Originally in : F&SF, June 2008. Very short piece from Reed, which feels like an hour’s work at the keyboard to get a germ of an idea down. The story is germ related, but didn’t really infect me. And putting Reed’s name on the front cover on the basis of a fairly unremarkable three-pager is a bit cheeky! Delia Sherman. Gift from a Spring. Originally in : Realms of Fantasy, April 2008. A very mainstream piece of fantasy writing that could easily have been published in a non-genre magazine. A young woman takes a summer job in rural France, and falls under the spell of the elderly ex-ballerina who has very strong links with the surrounding countryside. Snip out a couple of paragraphs and its entirely non-genre. Rivka Galchen. The Region of Unlikeness. Originally in : The New Yorker. An urban New York setting in which a young woman forms a relationship of sorts with two intense men. It’s a well-observed and detailed interdependent-troilistic relationship, and the sfnal element relates to the well-established sf time travel trope of the grandfather paradox, but the writing is subtle and clever enough to justify adding to that trope. Originally in : The Del Rey Book of Science Fiction and Fantasy. A sort of Horton Hears a Who for smart grownups. Not really, but tenuous enought for a weak pun on the editor’s name. I’ve not read as much of Ford of late, since a primary source of his excellent fiction was the much lamented (at least in this household) SCI FICTION. Daltharee is a city in a jar, a small city filled with humans, created in miniature by scientific advancement. Ford looks at the world from the perspectives of those in it, themselves looking out, and those outside, wanting to look in, and willing to take the ultimate step to be a true observer. Intriguing stuff. Ann Leckie. The God of Au. Originally in : Helix #8. Fantasy in which the capricious whims of gods, and the impact on those humans who have no option but to worship, is explored, as a very minor God is able to trick a human into giving it power of a group of islands. Will McIntosh. The Fantasy Jumper. A shorter piece from an IZ regular. At the fairground a few credits will have substantiated a living breathing person of your specification whose sole purpose it to attempt the death-defying leap into the fountain below. Except that it is simply too far to make without plunging to certain death. Various people with various motivations pay the small fee and enjoy the hopeless attempt and the plummeting fall and sickening landing, with the jumper quickly integrated into the concrete below. Meghan McCarron. The Magician’s House. Originally in : Strange Horizons, July 2008. A teenage girl gets help in becoming a magician from a neighbourhood magician, in a contemporary fantasy. James L. Cambias. Balancing Accounts. A strong SF story to open the issue, and one with an interesting POV character – an AI shuttling salvage and cargo amongst the asteroid belt. With very few humans this far outof the system, most of the trading and dealing is AI to AI. ‘Annie’, autonomous and incentivised, has a range of contacts with whom ’she’ regularly deals, indentured to The Company. When an opportunity which appears almost too good to be true presents itself, ’she’ decides, after some thought, to take it. However, before long into her trip carrying a valuable cargo, she finds that of course the deal is too good to be true, and the cargo she is carrying is human, and under threat from another human. There is a dramatic denouement as she uses all her cunning and equipment to protect the cargo, and her ethics. It’s a clever idea, and well-handled. An interesting look at the impact on individuals of big events, and the public persona/family life of key individuals. Humanity has reached for the stars as our life on Earth becomes increasingly threatened, and the son of the key person involved in that last gasp attempt to find life elsewhere is left with the memories of that person as his father, whilst the public perception is entirely different. Holly Phillips. The Small Door. Originally in : Fantasy Magazine, May 2008. A teenage girl, and her chronically/terminally sick twin, worry about what is going on in the garden that backs onto theirs. The old guys has a number of sheds, and he keeps animals in there. But what does he do with them? Sal attempts to find out, and with her sister rushed off to hospital emergency, goes against all advice and not only goes into the old guy’s garden, but follows him into his house, and into his cellar, and along a corridor that leads to … something magical. But not magical enough. Classy writing. Peter Watts. The Eyes of God. Originally in : The Solaris Book of New SF 2. A clever look at how a technological advance could impact on aspects of humanity that have been with us forever. A man is queueing up to board a plane, and following terrorist actions, the technology now in place is able to look deep into the mind. As he approaches the scanner his mantra is that he has committed no crime. And this is true enough. Except that lurking in his mind there is an attraction to a certain kind of criminal activity, and, no matter how far below the surface it is, the scanner finds it. And it fixes it. Watts looks at the implications against the man’s lapsed christianity, and the role of free will and self-determinatin. Alex Jeffers. Firooz and His Brother. The sands of the Middle East are the setting for a story featuring a young child, being protected by a dog, who is found in the wilderness. As with the Pollack story, a historical tale of the type doubtless still told around desert campfires, as it could have been for centuries. which doesn’t really suggest it stood out for me. Originally in : The Starry Rift, ed Gardner Dozois and Jonathan Strahan. SF vampires – perfect for the teen male readership I would guess. Certainly the kind of stuffy my 16-yr old has been reading for some time. We follow a vampire hunter, as he and some amateur hunters get rid of an infestation in and old building. The vampire hunter, a long-haired beardy bloke (initials JC), has been fighting this alien vampire infestation for a couple of millenia. Jay Lake. A Water Matter. The story is still online on the Tor.com website here, so my recommendation is to head over there and read it. Lake writes some really, really good SF, and this is more straightforward fantasy than I normally read. I enjoyed it – as he invariably does he puts effort into creating an interesting background to his story, rather than relying on a cod-fantasy quasi-medieval setting, and doesn’t go for the stereotryped roles women often have, and in this story features a woman facing a mortal challenge from a powerful adversary, and having to rely on her cunning and skills, and those of her colleagues, to meet that challenge. It’s visceral in terms of the action and the denouement, and altogether worth the read. Beth Bernobich. The Golden Octopus. Originally in : Postscripts, Summer 2009. A very clever and well wrought tale set in the Royal Court of Eireann. The Princess Royal’s eye is taken by a young inventor summoned to the King’s chambers, who demonstrates – up to a point – a machine that can send something forward in time. Not everyone is convinced, but the King has faith in the inventor, and the Princess’ fancy is very much taken. She follows his efforts over the years ahead, the struggles he faces, and the struggles she faces when she ascends the throne. And the denouement, in which the effect of the time travel on the reality she has known to that point, which is irrevocably, but subtly changed, works well. It is the subtle and ambiguous nature of the ending, rather than a heavy-handed seismic shift in the politics or the social structures of the world which often happens in such stories, that works well, rounding off a classy piece of writing. Erik Admundsen. Blue Vervain Murder Ballad #2 : Jack of Diamonds. Originally published in : Not One of Us. Deep South gambling on a riverboat for high stakes. Ah say, Deep South gambling on a riverboat for high stakes. Patrick Rothfuss. The Road to Levinshir. Originally in : Subterranean – Dark Tales of Fantasy. A wandering bard opens the story, which was not a good start for me, as I have some kind of allergy to fantasy featuring bards, wizards, princesses and so forth. Fortunately, this is an altogether darker take on fantasy tropes, exploring some of the nasty things that could happen in fantasy worlds. Truth be told, it explores some of the nasty things that could happen anywhere, and there’s not a huge amount of fantasy in there, and could easily be recast as a Western, and Eastern European Romany story etc. Elizabeth Bear and Sarah Monette. Boojum. Originally in : Fast Ships, Black Sails, ed Ann and Jeff VanderMeer. From a pirate-themed SF and fantasy anthology, which wouldn’t really have attracted me. I’m not a big fan of themed anthologies, on the basis that the whole reason for reading short SF is to get a lot of different ideas and settings, so a series of stories with a similar theme is defeating the purpose somewhat. Bear and Monette provide an intriguing take, with the main vessel being the star of the show, a biological space-faring creature within which humans ply their trade. The main human character, Black Alice, is fairly new to the game, but is finding a strong link with the ship, and this comes to her aid when brain-thieving pirates hove to. It’s a cracking story, and a setting which could do with further exploration. Karen Heuler. The Difficulties of Evolution. Originally in : Weird Tales. One of the weaker stories in the volume. It’s short, and it’s central conceit is one that I personally would need to have strong encouragement from other elements of the story to suspend my disbelief : human children are metamorphosing into any of a wide range of different animals or birds. No explanation is given, but I suppose it’s such an ‘out there’ conceit that to try to provide one wouldn’t make sense. The story begins with one mother struggling to come to terms with her second child beginning to change to another life form, but then moves into her making a similar change of her own. Cornell packs a lot into a short space – a sort of James Bond in space on acid. Hamilton is given a top-secret mission, and is soon to be off-world, masquerading as manual slave labour, in the hope of taking out the target he has been given. However, in the mines of the planet which he is working, there is a sudden revelation, and he comes face to face with his potential victim. It’s all done at breathtaking speed, with ideas firing off in all directions from an author with novels and Dr. Who scripts under his belt. There’s perhaps more than a touch of a visual feel to the story, more suggestive of a script. James Maxey. Silent as Dust. Originally in : Intergalactic Medicine Show #7. Nicely written ghost story. Not entirely sure why it’s in an SFF anthology. Mary Robinette Kowal. Evil Robot Monkey. Originally in : The Solaris Book of Science Fiction: Volume Two, ed George Mann. very much a story from someone who has yet to breakout of the semipro ranks. A monkey with a digital implant, making it more human than simian, is upset by some schoolchildren who come to visit. Erm, that’s it. As I recalled my initial reaction, I thought that I would give the story a second chance, and re-read it. But with the same lack of impact. Richard Bowes. If Angels Fight. Now, unlike the previous three stories, a story that is original, and almost too clever for its own good – like one very bright student in a class of otherwise average students. It’s one difficult to describe and to do it justice. You could spend a lot of time studying the story in order to fully appreciate its workings, in the way it subtly and sneakingly moves the reader through time, and different perspectives, and always gives the literary equivalent of seeing something from the corner of an eye, as opposed to clearly in 20-20 vision. The story is about that certain, undefinable something that some people have, and draws upon American politics, with a Kennedy vignette, and a family of several minor politicos. The angels to which the title refers are (inasmuch as the story makes such things clear) is the power that can lie behind the eyes of such people, and which can move between people, and which are there are important times. A man approaching retirement is brought in once again by the family of his old school friend, long since dead from drug-induced suicide, but whose influence remains strong, and quite palpable. I could go on, but I think I’m going to read the story again. It’s a standout. Originally in : Realms of Fantasy. Short piece of the type Williams does so well, a strange, very strange world in which a young girl is stillborn, but for whom that it just one of many beginnings and endings. The volume closes with a lengthy, dense and rewarding story of the far future, very much in a Stephen Baxter/Alastair Reynolds. Humanity has long since left Earth, spreading far and wide, and in a variety of guises. Empires have come and gone, and whilst humanity is now in many guises, we are very much still recognisably human. The story starts on a waterworld, with a young man approaching his coming of age – one in which he will move from being a singleton, to one who has several seperate facets of himself on which to draw. As he enters this period of change, so does his planet, as the distant cousins who have recently encircled their world, flee an even alien enemy. Through this several stages of development, we track the challenges he faces, and, through is longevity, his perspective on the challenges for the human race. I’m about a year late in reading this volume, so won’t spend too much time drawing conclusion about it, and about how it compares to Jonathan Strahan’s take on the year’s best SF and Fantasy other than to say that whilst there is some overlap, I’d be hard pressed to decide which I’d have to choose between if I had to. Perhaps Strahan’s for a slightly more ‘literary’ edge to his stories, and a minor quibble against Horton’s inclusion of a couple of stories in which the fantastical element is minimal. Fortunately, I don’t have to choose! Now onto this year’s crop of anthologies, which I intend to get through much more quickly! Shine. (Jetse de Vries, Solaris 2010). 2 Responses to Rich Horton. 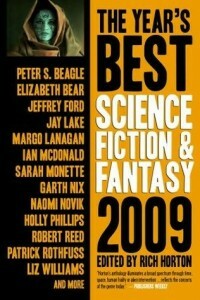 The Year’s Best Science Fiction and Fantasy 2009. Initials JI rather than JC. Remember what his knife was made from? And what it said about his boss?